You are warmly invited to join this celebration. Over 24 hours, 30 countries unite for a global Nordic Walk. Join the 5km or 10km, followed by refreshments, recognitions, and guest speakers. Ken Ring (keynote speaker), will talk about weather patterns and predictions. His speech promises to be a cracker! William Aitken Ltd, our product sponsor, will showcase their NZ company, a pioneer in its field. "Stand - Nordic Walk - Health" and "The Weight Mistake" will give you up-to-the minute health information which will encourage positive lifestyle changes. 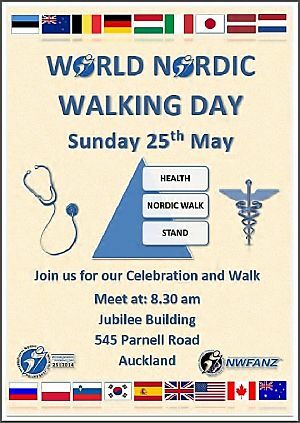 The achievements of our Nordic Walkers will also be recognised. The programme details are listed below. It'll be great to see you! Yes, you can, according to Ken Ring, weather-man extraordinaire! Ken is the keynote speaker and his talk, followed by questions & answers is not to be missed. 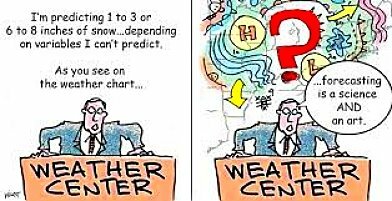 You will get an understanding of weather patterns, with a view that you can predict the weather. William Aitken Ltd, is a NZ family owned company, that imports quality food stuffs. Since 1944, the company's founder, William Aitken, showed great initiative, being the first to import olive oil. Other well known products include raisins and olives. In recognition of William Aitken's support, we have named our Nordic Walks the "Lupi Extra Virgins" 5km & the "Sun Maidens" 10km! 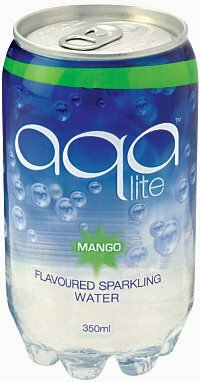 You will be able to enjoy the 'Aqa' lite sparkling water, which is a refreshing after exercise drink, helping to restore muscle energy reserves. 26 Oct 16: "The Whole Body Walks"